People now a days address me as a 'Mozilla fan' which is indeed very true. Its not even one complete year that I have started contributing to Mozilla, and within this short time, the kind of involvement I have with this FOSS organization is a big surprise for me too! In less than one year, I have been involved in several Mozilla organized events, somewhere as a volunteer, somewhere as just a participant and somewhere as an organizer and speaker. The experience had every time been awesome as well as a great learning. 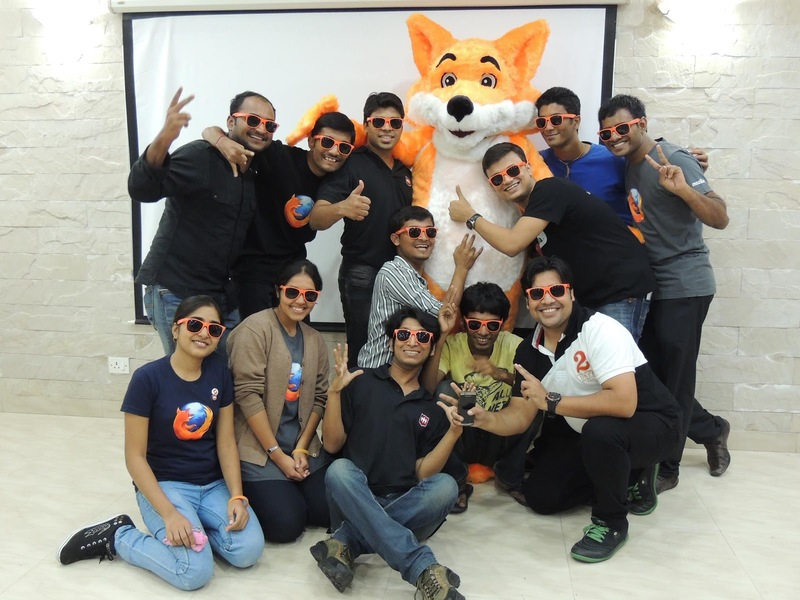 The day I got an invitation to be a Mozilla evangelist in an event which was being organized by a few FOSS enthusiasts in the city I am presently situated in, I felt pride, honour as well as loads of nervousness. I did immediately pull my socks and took this challenge up! The entire experience was not a fairy tale of-course. The journey from my residence to the event venue was a tough one. Private buses in rush hours and that too in the rainy season is not exactly a very pleasant experience but that couldn't get my enthusiasm down. Things got tougher when I took the stage and fired the first question to the audience-"Is anyone here aware of Firefox?" I got a very disappointing answer from the audience that Firefox, like Chrome is a Google product. Now this was the ultimate challenge. I knew I had to work harder this time to make my audience knowledgeable about Mozilla as an Organization, the different Mozilla products and the different ways of contributing to Mozilla. This was also my first event where I did take the entire session in the local regional language instead of English (well, English is the language I am mostly comfortable in). Once I began, things got easier and even before I had realized, I had already spoken for more than an hour....given out some goodies and also passed my Keon to the participants for a feel of how the Firefox OS looked like. The awesome part was the unexpected response I got from my participants. Along with innumerable request to help them get started with Mozilla, I also got a few invitations from a few students who were present in that event and wanted similar Mozilla events in their respective colleges. The Mozilla India Work-week was held on the 29th and 30th of June 2013 but the planning and preparations had begun way back. This was the first big (from my perspective) Mozilla event where I played the role of being a co-host (rather played some signification role) in the entire execution of the event. From planning the event, creating the event on the reps portal, planning the budget, sending down innumerable (mostly erroneous) mails...it was a learning at each step. Well, here I think I shouldn't forget to thank Soumya Deb for this opportunity as well as the awesome mentoring at each step. 28th June, Soumya da and I did reach the hotel before the rest of the reps to check the arrangements and be present to receive the rest of the participants. The best welcome that Mumbai could have given us was with its rains and it did it a bit too perfectly. Surprisingly, that was the only afternoon we got in Mumbai to actually go out and feel the drops. By the evening, our participants were in the house and once we all were together, well, no one knows how time flew for the next two days. The best part of day 0 was the unpacking of the Mozilla India mascot. Million thanks to Vineel for getting Mr.Foxy to Mumbai. It was Soumya who went into the costume first. I don't know if it was the costume's effect or it was the hidden side of Soumya which somehow came out that evening, but either ways, the performance then given by Mr.Foxy was hilarious. Serious work began from day 1. On 29th and 30th, we all did spend our day in the conference room. From 10am to 7pm....the awesome minds of Mozilla India were together in one room, finding multiple solutions to the tricky problems of the super fun Mozilla projects. As rightly stated by Soumya Deb: "The Task Force leaders of Mozilla India gathered to sit together & brainstorm about the intra/inter-taskforce operations in our community, and thus to carve the foreseeable-future pathway of Mozilla India." If needed to write the outcomes and success of this event, I will end up writing an entire report in my blog post (which I will preferably avoid here and post in the Wiki). The event review through the organizer's glasses can be found here.